When some people thought the name Second Chance Coffee implied that the beans were recycled, the founders knew it was time for a name change. The name Second Chance stemmed from the mission of the company – to help ex-offenders help themselves by providing gainful post-prison employment, job training and a community of acceptance. The company positively impacts the spiritual, social and economic condition of their employees, their families and the communities in which they live. All that and they make what many people say is the smoothest cup of coffee they have ever tasted. (It’s so smooth, most of their customers drink it black.) Second Chance wanted us to create a memorable name that they could monetize, like we had done for frozen yogurt franchise Spoon Me and the chain of laundromats we named Stuff a Sock in It. After reviewing dozens of names, the top contenders were narrowed down to Happy Joe Lucky, I Dream of Coffee, Thank God It’s Coffee, and I Have a Bean. We felt that I Have a Bean made the biggest emotional connection and had the strongest potential to make our client rich through the sale of t-shirts, mugs and coffee canisters. The client agreed. The tagline we created, “Inspired Coffee” helps set the tone that the company is inspiring people to live better lives. We are thrilled with the package design, which was created by Carrie Dufour and her talented team at Sloat Design. 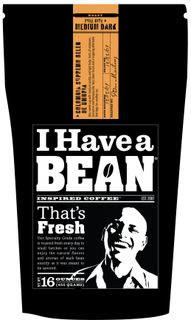 We snatched up www.ihaveabean.com for $9.95 and the site and brand officially launch on June 1st. Until then, follow them on Twitter, at I Have a Bean.